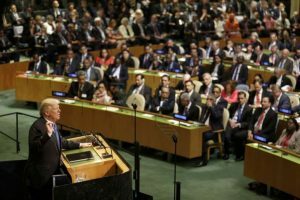 The subdued response may have been a stoic display of diplomatic calm, the core competency of those responsible for unraveling international crises. Or, more dangerously, is it a sign we’re growing complacent about the president of the United States thumbing his nose at legal, international and ethical norms? A marketing theory that describes how consumers respond to persuasive messaging – the kind you get from a repeated ad for soap or a politician on the stump – offers some clues, and some hope. 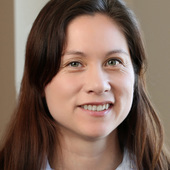 Over the last several years, I have been working with social scientists to understand how consumers respond to medical information in attorney advertising. In the course of these collaborations, I learned that consumers respond to persuasive messages – including a president’s – in a much more complex way than you might expect. In 1994, marketing professors Marian Friestad and Peter Wright wrote a landmark paper that changed the way researchers thought about how consumers respond to persuasion. Previously, researchers tended to assume that consumers approached persuasive messages somewhat passively. Scholars knew that consumers responded differently depending on whether they had a high or low engagement in the marketing message. But they were less interested in how they engaged with those messages. Friestad and Wright placed consumers at the center of their model. 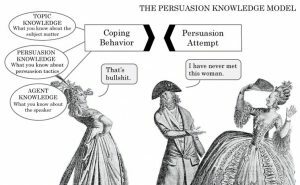 They believed that consumers are sophisticated in how they process persuasive messages, bringing to bear their knowledge of the subject matter, the source of the information and their knowledge about persuasion tactics. If consumers believe that the source is untrustworthy, or that the advertiser is trying to use a deceptive tactic against them, they can respond by discounting or ignoring the message. For example, say a woman spots her boyfriend arm in arm with another woman. After confronting him, she will assess his proffered explanations in light of what she knows about him (something called “agent knowledge”) and how men usually try to explain their way out of such predicaments (known as “persuasion knowledge”). If the boyfriend insists that he has never met the woman, according to the Friestad and Wright model, she would then “cope” with his persuasion attempt by disbelieving his explanation. Friestad and Wright also described the moment at which consumers realize an advertiser is trying to persuade them as a “change of meaning.” An illustration of this is the moment you realize a co-worker who is complimenting your new hairstyle wants to ask for a favor and is not being merely friendly or just making idle chit-chat. 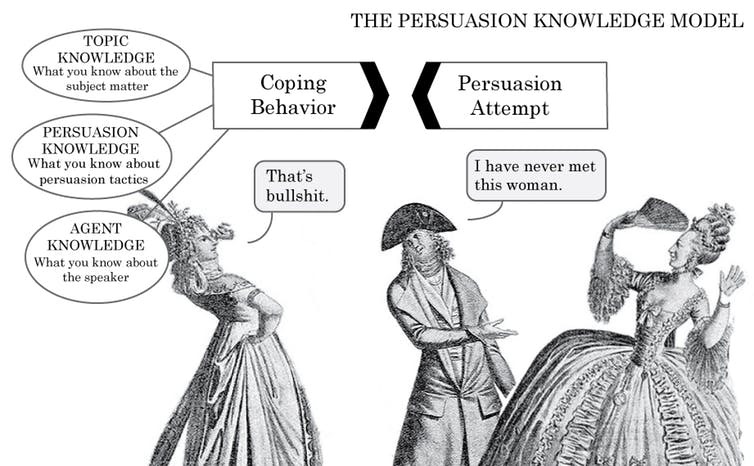 According to Friestad and Wright, we are constantly updating our knowledge about persuasion tactics and the reliability of different sources, partly based on folk knowledge and partly our own experience. Their model also explains why people respond differently to the same message at different points in time. The next time you see the flattering co-worker, you’ll be more skeptical of his compliments – and maybe those you receive from others in the office as well. The Friestad and Wright model offers a useful way to think about how a nation adapts to a president prone to exaggeration, accusation and outright lying. For better or worse, we don’t interpret Trump’s statements the same way we did a year or two ago. We apply what we have learned about Trump as a person and his arsenal of persuasion tactics. This tweet is Trump doubling down after being accused of lying. That one is Trump trying to appear powerful or unpredictable. The next is Trump trying to appeal to his base after seeming to take a moderate position on an issue. And sometimes a Trump tweet is just a tweet, or, for lack of a better word, covfefe. In other words, we are more conversant in Trump-ese. A picture of golfers next to a forest fire went viral on social media as a symbol of complacency in a crisis. But as the photographer explained, the golfers were not as close to the fire as the picture suggests. Similarly, a more muted reaction to Trump’s inflammatory statements is more complex than it seems. Once Trump is viewed as an unreliable or dishonest messenger, we respond by discounting the message. It ends up in the same mental category as a beer commercial. Of course, a president’s words matter. 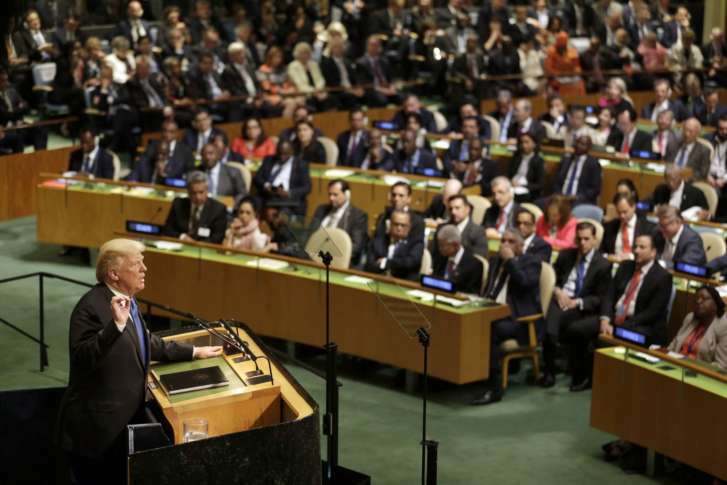 We can hope that North Korea will recognize the speech as mere saber rattling, though some experts expect the reaction will take the form of missile tests. That doesn’t make Trump’s bizarre approach to diplomacy less reckless, especially coming from someone with unilateral authority to launch a nuclear strike. And not everyone approaches the president’s words with similar levels of skepticism. When a president falsely equates civil rights demonstrators with neo-Nazis, it emboldens white extremists. Nevertheless, increased familiarity with Trump’s persuasive style affords some cognitive space for decision making by his listeners. Like the beer commercial, we can recognize the persuasion tactics and consciously decide how to respond – whether that means by calling it out, ignoring or discounting the message, or focusing on other issues of public importance. That’s not complacency. That’s democracy at its best.